Delightful little sugar box, the cover having pretty floral pattern to the finial. Backstamp: Aladdin Adams Estd 1657 England. Excellent condition. An attractive hexagonal sugar with lid. There is a tiny tiny nick to the inside rim otherwise excellent. Ironstone. Small sugar box with cover. Backstamp: Adams Made in England. There is a little minor wear to the inner rim of the box otherwise excellent condition. Would once have had a cover, which is now not present. Small chip to the rim and a little discolouration inside otherwise fine. Large sugar bowl beautifully patterned both inside and out. Backstamp: Rd No. 623294 This Pattern was introduced by William Adams in 1780 being a copy of a Chinese pattern & one of the first of its style produced in English Pottery Wm Adams England. Light crazing with just a hint of discolouration inside. Delightful individual size sugar bowl. Backstamp: Chinese Bird Adams England. There is a tiny tiny manufacturing fault on the side otherwise it is in excellent condition. Delightful little bowl with different cartouche eitherside of the body. Backstamp: Adams England. Pretty little bowl with two different cartouches either side. Unusual backstamp: W Adams & Sons England & three swords/scimitars within a shield all printed in red. Delightful little pot printed in a steely blue. Backstamp: English Countryside Adams Est 1657 England. There is a small minor glazing fault under the rim of the cover otherwise excellent condition. Lovely little bowl in excellent condition. Small vignette of pattern inside to the base, with the floral border inside the rim. Blue printed backstamp. Earlier version with cows rather than horses. Just a touch of crazing inside. This pattern also known as Hibiscus and this sucrier was made by William Adams of Stoke. This is an absolutely fantastic piece with an ornate collar. Both base and cover are crazed. There is a rough area on the rim below the collar where it touched another in the kiln. The collar itself has two chips around the edge and another couple of small ones on the rim. The inside rim is a little nibbled and has a manufacturing chip which has been glazed over. The side handles have a few minor signs of wear. The cover is badly damaged around the rim, however the pretty flower finial is beautifully intact. It is our policy to mention all faults which makes this piece sound pretty awful, however as usual it sounds far worse than it actually looks. Impressed Adams Warranted Staffordshire. Main pattern outside and narrow border pattern to the inside rim. Very small sugar bowl printed in a rich dark blue. Backstamp: Old Willow AdderleyWare Made in England. Crazed otherwise absolutely fine. A little light crazing otherwise excellent. Bone china with gilt. Delightful little bowl printed in a mandarin blue. Backstamp: Adderley Fine Bone China England and in script H129. Excellent condition. Delightful little bowl with main pattern around the outside and border pattern around the inside rim. Backstamp: Allertons Made in England. Barker Bros, Royal Tudor Ware. Pretty little piece with two different rural scenes either side of the bowl. A klittle very minor wear to the rim otherwise excellent. Barker Bros, Royal Tudor Ware. Pretty shape bowl with two different rural scenes either side. A little light crazing otherwise excellent. Barker Bros, Royal Tudor Ware. Pretty little piece with two side handles a flower finial to the cover. The handles have one or two lines of crazing and a little minor wear otherwise excellent condition. Pretty round fluted sugar pot with two loop side handles and cover. Pink printed backstamp Old Castle by Barratts. Made by Barratts of Staffordshire, who had their pottery at Burslem. Dimensions: 9 cm x 10 cm / 3.5 ins x 4 ins. Bone china with gilt rim. Bone China with gilt. A gorgeous individual sugar bowl. Backstamp: Bisto England below Caduceus. Excellent condition. This would once have had a lid, but is a delightful piece on its own. Small firing fault inside to the base and just a touch of discolouration otherwise fine. The transfer is a little smudged in one place. Tiny little bowl with gorgeous rural scene around the outside, grapevine border around the inside rim and small rural scene inside to the base. Light all over crazing and there is a small mark on the foot. Gorgeous little bowl with full pattern around the outside, decorative grapevine border around the inside rim and small rural scene inside to the centre. Backstamp: British Scenery Booths Silicon China Made in England. There is a small glazing fault to the rim otherwise excellent condition. 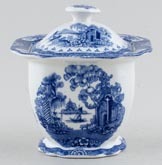 Charming little bowl, with a wide pretty vine border decoration inside the rim, rural scene cartouche in the base and rural scene around the outside of the body, all printed in a steely blue. Backstamp: British Scenery Booths Silicon China Made in England. Excellent condition. Pretty little bowl with lovely rural scene either side and lovely border pattern inside around the rim. A few minor signs of wear but overall good. Blue printed Booths backstamp with A8025. Pretty little bowl with gently moulded body. It has the same rural scene either side, with the lovely grapevine and wheat border around the inside rim. Backstamp Booths Made in England British Scenery A8024. Delightful little bowl with rural scene around the outside of the body and wheat and grapevine border pattern around the inside rim with small rural scene cartouche inside to the base. Backstamp: British Scenery Booths Silicon China Made in England. Light all over crazing with a little minor wear to the rim otherwise excellent condition. This is a lovely piece with gently moulded body and pretty flower finial to the cover printed in a steely blue. Backstamp: Booths Made in England British Scenery A8024. Excellent condition. With gilt. Tiny little individual sugar bowl, part of the breakfast in bed set. A little wear to the gilt around the rim otherwise excellent. Blue printed backstamp: Booths Silicon China Made in England. With gilt. Lovely little bowl printed in a light steely blue. Backstamp: Booths Silicon China Made in England and black printed Patt. No. 9780. Light all over crazing with a little wear to part of the rim. Large plain round sugar bowl. Blue printed without gilt. Blue printed with gilt. Plain round shape. Gilt to rim worn. With gilt. Backstamp: Booths Silicon China Made in England Patt No 9780. Gilt on rim worn. Very pretty little sugar pot with two ornate side handles and pretty finial to the cover. Backstamp: Booths Made in England Dragon. There is a little minor wear to the inner rim and a little minor discolouration inside, overall absolutely fine and a lovely piece. Green and white. Pretty little covered pot with moulded body and moulded decoration to the cover. The finial has a couple of very small under rim chips. Green and white with gilt rim. Some wear to gilt, but good condition overall. With gilt. Very small individual size sugar bowl. Backstamp: Blue printed Booths Silicon China Made in England Jacobean. Light crazing otherwise excellent condition. With gilt. Lovely pattern printed in a light steely blue. Backstamp: Booths Made in England Lowestoft Deer A8063. Light crazing otherwise excellent condition. Gorgeous little bowl, blue printed under the glaze with hand applied enamel colour and ochre rim. Backstamp: Booths Silicon China Made in England Netherlands. Light crazing and there is just a little glaze missing underneath, overall excellent condition. Small bowl blue printed under the glaze with hand applied enamel colour. Backstamp: Booths Silicon China Made in England. Delightful little lidded sugar bowl with ornate side handles, pretty finial to the lid and gently moulded body all printed in a steely blue. Backstamp: Booths Made in England Peony A8021. Excellent condition. With gilt. Delightful small sugar bowl. Backstamp: Booths Silicon China Made in England Powder Blue Lily. A little very minor wear to the rim otherwise excellent condition. Wear to rim. Small chip under foot rim. Silicon China made in England mark. A8025 With gilt. Backstamp: Booths Made in England Real Old Willow A8025. Gilt quite worn. With gilt. Crazed with a little associated staining inside. Gilt still good. Backstamp Booths Silicon China Made in England Real Old Willow. No gilt version of this pattern. Backstamp: Booths Made in England Real Old Willow A8025. Excellent condition. With gilt. Fabulous very small individual sugar bowl. Backstamp: Booths Made in England Real Old Willow A8025. Excellent condition. With gilt. Backstamp: Booths Made in England Real Old Willow A8025. Excellent condition. With gilt. Backstamp: Booths Made in England Real Old Willow A8025. A little minor wear under the foot and to the gilt and the occasional minor printing blemish, overall excellent condition. With gilt. Delightful small sugar bowl. Backstamp: Booths Silicon China England Real Old Willow. Crazed with a little discolouration and a couple of very small manufacturing blemishes inside, overall excellent with the gilt still intact. With gilt. 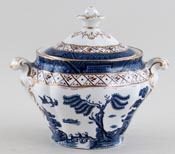 Delightful lidded sugar with ornate side handles and finial to the lid. Backstamp: Booths Made in England Real Old Willow A8025. There is a tiny tiny nick to the inner rim and a very small unsprung chip under the rim of the lid. Sounds worse than it looks! With gilt. Backstamp Booths Silicon China Made in England Real Old Willow. Some wear to the gilt otherwise excellent condition.